Rapid Gemstone Certificate – the Certificate includes the complete list of your Jewels. 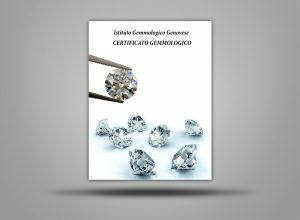 This Certificate describes the key characteristics of your pieces of Jewelry, and, in addition, includes the market value of each Jewel. All Certificates have serial numbers, and in case your Certificate is lost, we will issue a duplicate. The price of the Rapid Gemstone Certificate is 40 euros for every piece of Jewelry. If you need just a verbal appraisal with no verifiable record, it will cost 20 euros. 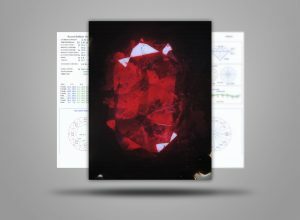 Gemstone and Diamond Verification – in this report we identify the Group, Type, Variety and Color of the Gems. For Diamonds, we specify the key characteristics with detailed information. In these reports we disclose Gem treatments for both: the loose stones and stones mounted in a piece of Jewelry. All Certificates have serial numbers, and in case your Certificate is lost, we will issue a duplicate. The price of the Gemstone and Diamond Verification Report is 75 euros for one stone up to three carats, and 100 euros for stones weighing more than three carats. 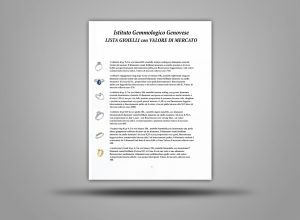 Gemstone Certificate – 3 pages including an in-depth analysis with the distinctions between Synthetic and Natural Gemstones. It contains a complete description of your Gemstone’s 4Cs: Color, Cut, Clarity and Carat Weight. Also, we disclose possible treatments of the Gems. The Certificate is accompanied by the different pictures that show the inner world of your Gemstones. The evaluation is performed only if your Gemstones are unmounted. Blister is available upon request. All Certificates have serial numbers, and in case your Certificate is lost, we will issue a duplicate any time. The price of the Gem Certificate is 200 euros and doesn’t depend on the carat weight. The Diamond Certificate describes the distinctions between the synthetic and natural Diamond. 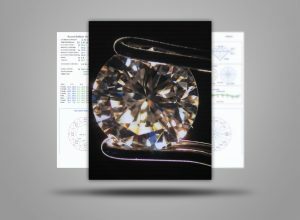 It includes a complete description of your Diamond’s 4Cs: Color, Cut, Clarity, Carat Weight, discloses possible treatments of the Diamond. The Diamond Certificate contains numerous photos that reveal the beautiful landscape hidden inside of your Diamond. The evaluation is performed only if your Diamond is unmounted. The price of the Diamond Certificate is 200 euros for a Diamond up to 3 carats.